Fact of the Day: Son Goku (Japanese), originally Sun Wukong (Chinese), was not originally so OP when he first burst out of the rock on Flower Fruit Mountain. In fact, he was just a monkey that was a bit bigger and tougher than the rest. Okay, he was born from a rock, but let’s face it… monkeys aren’t that picky. All it took to hail him as the Monkey King was for him to rush through a waterfall into cave. Hardly astounding. What often gets glossed over in adaptations or abridged versions of Journey to the West is the first two episodes, in which Wukong travels all over the East to find a teacher, and studies under the mysterious teacher known as Subhuti for seven years. From the description, Subhuti’s power may be strong enough even to rival Buddha himself, and it is he who teaches Wukong the 72 tricks and how to master the nimbus cloud. His only condition when Wukong leaves is never to reveal that he is his master. Taking a full suit of the best armor from the Dragon King’s Palace, as well as the extendible Jingu Bang. So there you have it, that’s how Wukong came to be known as the Monkey King a.k.a. Qi Tian Da Sheng (齊天大聖) a.k.a. Great Sage Equal to Heaven as he titled himself. It all started with a stubborn monkey. Note that the above information refers only to the original Journey to the West classic novel and not any other adaptations. 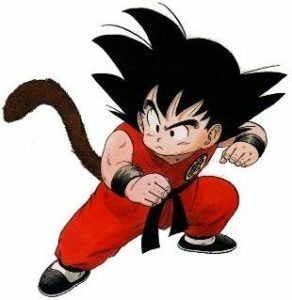 Wukong/Goku as a character has been adapted in many different manga, with Dragon Ball and Saiyuki being the most famous ones. The Monkey King by Terada Katsura is also a worthwhile read that’s faithful to the original story. RequestThrottled: AWS Access Key ID: AKIAI32PK6CAX7KJHC4Q. You are submitting requests too quickly. Please retry your requests at a slower rate.